Description: (Obverse) the uncrowned effigy of King George VI, text around GEORGIVS VI D G B R OMN REX F D IND IMP; (Reverse) two lions flanking an oak sapling crowned with the dates 1939 and 1945 at each side and wavy lines representing the sea below. 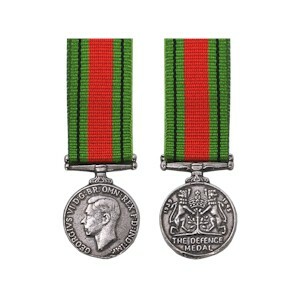 The words THE DEFENCE MEDAL appear in the exerque. Comments: Awarded to service personnel for three years' service at home or six months' service overseas in territories subjected to aid attack or otherwise closely threatened. Personnel of Anti-Aircraft Command, RAF ground crews, Dominion forces stationed in the UK, the Home Guard, Civil Defence, National Fire Service and many other civilian units qualified for the medal.